Dr. David C. Amberg has been appointed interim president of the SUNY College of Environmental Science and Forestry (SUNY-ESF) by the State University of New York Board of Trustees. His appointment is effective July 1, 2018. "Dr. Amberg's expertise in research and the sciences will greatly benefit the SUNY College of Environmental Science and Forestry, as will his dedication to excellence in teaching and fostering creativity inside and outside of the classroom," said SUNY Chancellor Kristina M. Johnson. "The importance Dr. Amberg places on research will allow for SUNY-ESF to continue to set itself apart as an institution and embrace new opportunities for innovation and entrepreneurship. Congratulations to Dr. Amberg on his appointment." "I am humbled and honored to be asked by the Chancellor and SUNY Trustees to act in this interim role to support the SUNY College of Environmental Science and Forestry," said Dr. Amberg. "I consider SUNY-ESF to be a gem in the SUNY system whose relevance both in research, education, and community outreach could not be more critical at a time of environmental degradation and environmental change. "Mission is critically important to me and SUNY-ESF's mission could not be more aligned with my values. 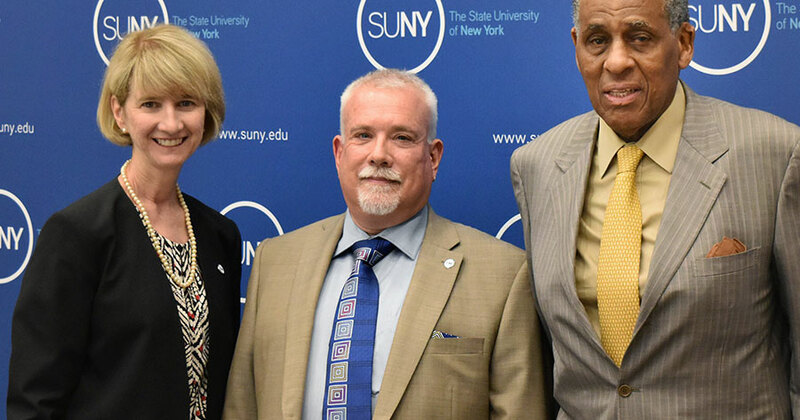 I look forward to working very closely with the outstanding faculty, moving forward in a positive direction, and preparing SUNY-ESF for its next permanent president," he added. Amberg has served as vice president for research at Upstate Medical University since December 2014, overseeing the clinical, translational and basic research portfolios of the campus. During his tenure, Upstate Medical has seen three consecutive years of near double-digit growth in research expenditures and a five-fold increase in clinical trial expenditures. He has also held academic appointments in Upstate Medical's Department of Biochemistry & Molecular Biology since 1996 and was named full professor in 2008. He was awarded the President's Award for Excellence in Teaching in 2004, was named a SUNY UMU Jacobson Scholar in 2009, received the President's Award for Excellence and Leadership in Research in 2011, and was awarded the Chancellor's Award for Excellence in Scholarship and Creative Activities in 2012. Dr. Amberg earned his doctorate in biochemistry from Dartmouth Medical School in 1992. He completed a postdoctoral fellowship at Stanford University School of Medicine in the Department of Genetics, and earned a bachelor of arts in biology/chemistry from Whitman College in 1983.